Get rid of the usual boring and common gift and favor pouches. It’s time to level up those goodie bags and travel storage packs into something that is a little more fun to look at. kilofly Egyptian Style Jewelry Coin Purse is a new way to store favors for a wedding, baby shower or birthday party and protect your small valuables when traveling. With their drawstring closures, they will secure all your treasures safe when packed. They are lovely to store gifts, jewelries, candies, coins, charms and more. Definitely a unique designed party and travel Must-Have! 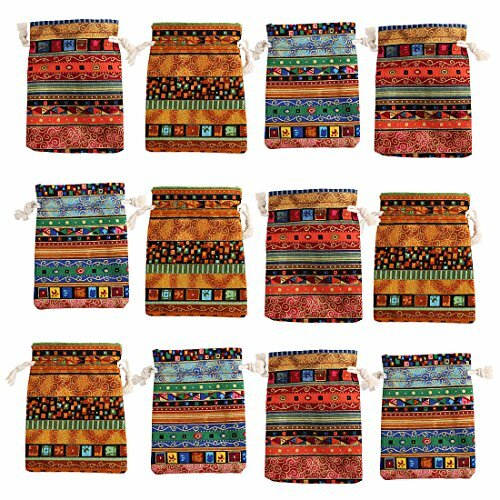 This set includes 12 Egyptian style pouches of assorted designs as shown in images. Note: Colors and designs of the pouches may differ from those shown in images.